The 4K screen revolution is well underway. Home televisions equipped with the pixel-busting resolution now attract a small premium over the best full HD champions of yesteryear. Computer screens, on the other hand, have been slower on the 4K ramp-up. Consulting various surveys, most notably Steam's, shows that full HD is still used by the masses, but practically all manufacturers have at least one 4K panel in their 2015 line-up. ViewSonic, for example, touts four 4K monitors in its arsenal, ranging from a rather small 23.6in to the usual 27/28in, thus offering a good compromise between screen size and pixel density. The most intriguing one of the quartet is the VP2780-4K that's built for the CAD, photography and video editing folk who desire colour-accurate reproduction and lovely pixel density in one tidy package. And color-accurate, in this instance, means the monitor provides 100 per cent of the sRGB spectrum, 80 per cent of the Adobe RGB space, and 75 per cent of the NTSC spectrum. What's more important, arguably, is that each VP2780-4K monitor is calibrated at the factory to provide far better colour accuracy than normal - the displays, we're informed, have a maximum colour delta of less than two. Appearance wise, the VP2780-4K's technology is housed in a standard 27in chassis that's rather generic in nature. The bezel is reasonably thick for a modern screen while the actual panel is set back a few more millimetres than normal. 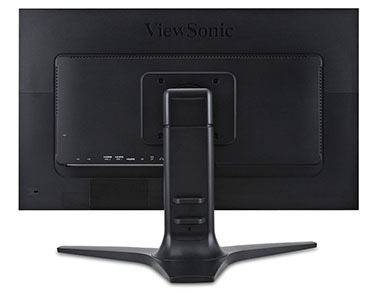 Build quality is above average for a consumer monitor, mind, and the three-pronged stand, which goes back over 30cm, provides a very solid base. 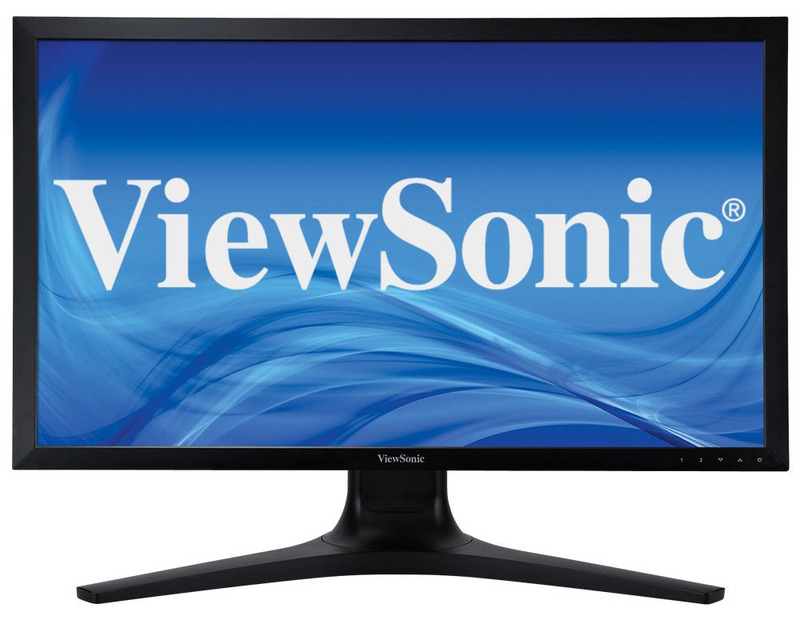 ViewSonic uses an IPS 4K panel with the usual wide, 178-degree viewing angles, and the company provides a zero-dead-pixel guarantee. The screen is backed by a standard three-year warranty but is extendable by another year once you register. A static contrast ratio of 1,000:1 and brightness of 350 cd/m² are standard fare for a modern display and a 5ms grey-to-grey response time is also well within the standard we expect to see. The stand attaches easily to the triangular base which enables the screen to be arranged in portrait mode easily. There's a decent amount of adjustment to get it just right - 60 degrees of swivel on each side, 90 degrees of pivot, a total of 28 degrees of tilt, and height adjustment of up to 150mm. In short, you can get the display to sit exactly how you want. And ViewSonic does a good job in terms of inputs. Bereft of speakers, understandably, there's HDMI 2.0 for running 4K at 60Hz, two DisplayPort 1.2a, a mini DisplayPort in, and two HDMI/MHL 2.0 for smartphones/tablet connectivity. Keeping the high-speed connectivity intact, four USB 3.0 - two on the bottom, two on the side - complete the package, though it's a tad strange not to see a card reader included. Switching it on reveals a bright, poppy image that's a result of the 100 per cent brightness the screen ships with. Adjustments via the on-screen display are basic, however, with four touch-sensitive buttons used to navigate a small display that can be moved around the panel. Catering for the professional crowd, there are five gamma presets - ranging from 1.8 to 2.6. The high pixel count is used to good effect via ViewSonic's MultiPicture mode technology, where it can be split into four full-HD segments for easy concurrent viewing of multiple pages. Building a screen for a specific purpose, in this case to appeal to professionals who need a colour-accurate monitor, inflates the price to around £700, or £300 more than generic 4K monitors that are available from all and sundry. The question as to whether it's worth it depends on the need for colour calibration out of the box, though a small stumbling block may be the 80 per cent Adobe RGB colour space. Let's now run it through a gamut of tests to see if the VP2780-4K can live up to its lofty billing.